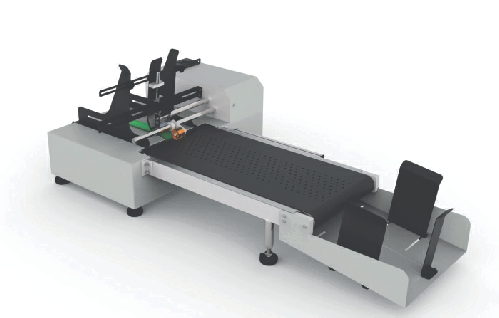 The feed system features friction in-feed coupled with vacuum hold-down bed for secure and consistent handling of flat products such as pouches, lidstocks, paperboard sleeves, die cut labels, die cut parts, header & blister cards and other similar matte, polished or varnished products for presentation to Bar Code Readers OCR &/or Vision Systems to make a complete off-line verification product identification system. It can feed flat products up to 12” wide x 14” long; and up to 3/8” thick. The bar code verifier will make a 100% inspection of each flat product. A Bar Code Verifier will read the Bar Code that was entered and actually do a verification of the attributes (density, type, spacing, width, etc.) and Grade it as an A,B,C, D or F.
A more comprehensive vision inspection system breaks down the Vision Inspection of the desired copy in up to 4 Quadrants so that the customer can isolate up to four sections of the read area for four separate vision inspections. Electrical Requirements: 110/220 VAC @ 50/60 Cy. Product Size: 2” x 2” up to 12” x 12” Std.